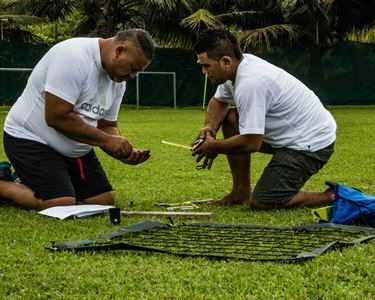 The seminar was the first of its kind in Oceania, introducing the FIFA Pitch Quality Kit and how to assess field using this equipment. At the helm of the workshop was facilitator and pitch consultant Dr. Marke Jennings-Temple from the Sports Turf Research Institute in Australia. In his address to the participants at the opening ceremony, CIFA President Lee Harmon noted the key role of a groundskeeper. “Training players and coaches is important, but looking after what they play on is even more important,” Harmon said. Participants included CIFA turf manager Edwin Browne and his assistants Anthony Samuela and Lai Gukisuva, Avatiu field groundsman Martin Mitchell, BCI National Stadium field maintenance manager, Makirau Haurua and his assistant Christopher Tangatakino, as well as Aroronga FC President Junior Areai. “In the short amount of time we’ve had with Marke I have learned a lot of new things that could help with maintaining our grounds here at CIFA,” said. The seminar came to a close on Friday afternoon with the CIFA President and General Secretary joining in the meeting.